Ever since I first heard of Tulips on Troost a few years ago, I’ve thought the nonprofit exemplified the kind of restoration that builds community, and I wanted to find out more about it. My reasons for supporting this group go far beyond my passion for tulips, so I will briefly explain. Kansas Citians like myself know that the city has always been racially divided. Before World War II, blacks were restricted to living in the areas north of 27th Street, which included the fabled 18th and Vine jazz district. White people lived in the South Side or Southtown, which encompasses areas on either side of Troost Avenue from 27th to 75th. My father grew up east of Troost in the 1930s. After the war, white people left those neighborhoods, and blacks moved in. Over time, Troost became a dividing line between the more prosperous white and the neglected black areas of town, symbolizing blight and danger. 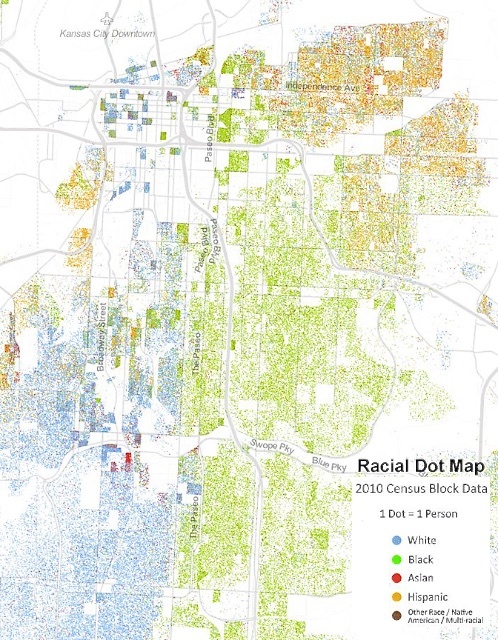 In the map below, Troost is not labeled, but you can find it by looking at the place where the green area (black neighborhoods) meets the blue area (white neighborhoods). I’ve never feared the areas around Troost the way some Kansas Citians do, but I had no idea how to soften the racial divide. But Durwin Rice, co-founder of Tulips on Troost, did have a catchy idea—plant tulips. On my last trip home, I arranged to interview him. 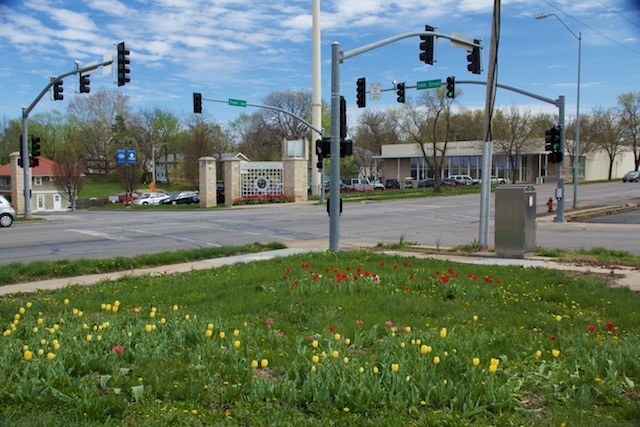 According to Rice, Tulips on Troost aims to remind Kansas Citians of all the avenue’s history, not just the last fifty years of neglect, and to honor Benoist Troost, Kansas City’s first doctor, for whom the street is named. Troost is a Dutch word, so tulips, associated with Holland, were perfect for encouraging a new view of color on the avenue. Historical reasons aside, tulips bring the bright colors of spring to an avenue lined with shuttered historic buildings and services for homeless people. They get the media’s attention. As Rice said, they make people smile. And when I drove the length of Troost Avenue and saw the bright blooms bending in the breeze, I did smile. I started at the northern end of Troost, near the Missouri River from which Kansas City flows south. At 10th Street in the West Paseo neighborhood, I found a narrow sidewalk strip thick with blooms. 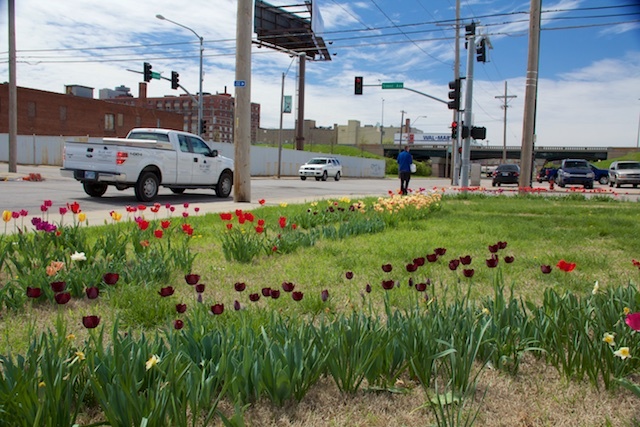 These days Tulips on Troost partners with neighborhood groups that recruit volunteers. The tulips pictured above are some of the 8,000 bulbs those volunteers planted last year in West Paseo. In fall 2015 they’ll plant more in that neighborhood. As I stood on Troost, trying for a decent photo in the glaring sun, a woman stopped to ask me what I was photographing, as people often do. She seemed amazed that the beds had not been trashed by homeless people coming to the mission across the street. One of the drawbacks of planting tulips for beautification is that they thin out after a few years. This bed at 18th Street, planted in 2011, still has plenty of my favorite Queen of the Night tulips, so purple they are almost black. But soon it will need replenishment. And there lies the challenge for Tulips on Troost. Do they stick with the approach used since 2007, which Durwin Rice called “guerrilla,” in which they put tulips anywhere they could? It works: since 2007 volunteers have planted about 800,000 bulbs. Or do they get more disciplined and focus on showcase beds that are re-bulbed every year? That would surely require more money and might limit the areas that could be planted. Halfway down Troost at 54th, Rockhurst University’s monochrome beds argue for the showcase approach. Even this late in the blooming season, they are still stunning. But in this vacant lot across from the university entrance, I spotted tulips spirited and hardy enough to rise above the dandelions year after year. To me, they embody the spirit of Troost: embattled but persistent, a beautiful example of a community rebuilding itself. When I told Durwin Rice I thought planting tulips was a form of restoration, he became a little sad. He thinks of restoration as preserving historic homes, and he now lives in a large home on Benton, about a mile east of Troost, that he and his partner have restored. Too many old homes in black neighborhoods are being replaced with modern buildings for his taste. He said he feels like a lonely voice in the wilderness, and he hopes more Kansas Citians will come to see the old homes and old neighborhoods as worthy of preservation. The top two pictures here are of the planting at the 70th Street YMCA, in 2007 and 2015. The bottom two come from 85th Street, in the Marlborough neighborhood, near the end of Troost.